This woman giving me a pedicure could see as plain as day the signs of a serious health condition right there in my feet, but it would take 10 more years to finally receive my formal diagnosis: severe hypothyroidism. In 2012, a study was designed to identify the cutaneous (skin) manifestations of hypothyroidism, an under-active thyroid. Of the four hundred and sixty diagnosed cases of hypothyroidism, 300 patients (65.22%) presented with dry, coarse skin. In another study that same year, 100% of subjects with hypothyroidism had coarse, rough, dry skin. Palmoplantar keratoderma, found in 33%, is a term that refers to a group of skin conditions with marked thickening of the skin in the soles of the feet and palms of the hands. Hyperthyroidism, over-active thyroid, due to the autoimmune condition Graves’ disease may also present with thickened dermis. While it may seem contradictory, it is often the case that some symptoms of hypothyroidism and hyperthyroidism present the same. Pruritus is the medical term for itchy skin. Chronic pruritus can present in both hyperthyroidism and hypothyroidism. Itchiness can happen all over the body not just the feet, including the legs, scalp, and even the genitalia. In the case of hypothyroidism, it may be that the very dry skin is the cause of the itchiness. Researchers suggest that pruritus and even chronic urticaria (chronic hives) may be associated with thyroid autoimmunity, including Hashimoto’s thyroiditis and Graves’ disease (Graves’ disease is the term used in the United States and the term Basedow’s disease is more commonly used in Europe.) When you develop one autoimmune condition, you are more vulnerable to develop multiple autoimmune conditions. It is, therefore, important to mention that the Cleveland Clinic lists several autoimmune conditions associated with chronic pruritus including Sjögren’s (SHOW-grins) syndrome, lichen planus, and psoriasis. Dr. Barnes analyzed the body’s basal body temperature (BBT). Before arising in the morning, the patient’s axillary (underarm) temperature was taken. Normal underarm temperature is between 97.8°F and 98.2°F (36.6°C and 36.8°C). Consistent below-normal temperatures indicate hypothyroidism and consistent above-normal temperatures indicate hyperthyroidism. Heart disease, kidney dysfunction, diabetes, and skin infections are common culprits considered when a patient presents with swelling of legs and feet, but the possibility of hypothyroidism should always be considered. Swelling (edema) is a classic symptom of hypothyroidism and this includes swelling all over the body. In 2013, a 21-year-old presented with generalized swelling including pitted edema in both legs and feet. In contrast to non-pitting edema, pressing of the pitting edema will cause an indentation to remain on the skin well after the pressure is released. Her edema subsided with thyroid medication. According to professor of medicine Dr. Neki, peripheral (the extremities including the arms, legs, feet, and hands) is found in 55% of hypothyroidism patients and periorbital edema (swelling around the orbits of the eyes) is found in 22%. Muscle, joint and nerve pains are not usually stressed as primary symptoms of hypothyroidism, but after years of hearing from hypothyroid patients at Hypothyroid Mom, there is one thing that I am certain about. Full thyroid testing should be conducted on every single person that presents with chronic pain or fibromyalgia. 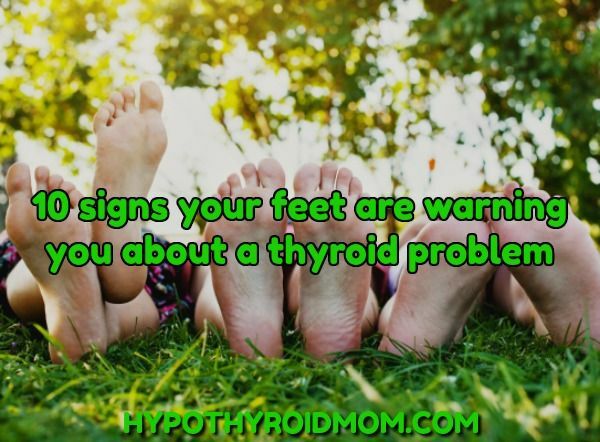 The number of people that write to Hypothyroid Mom about plantar fasciitis, the pain along the bottom of the foot especially the heel that shoots through them especially when they step out of bed in the morning, can’t be a mere coincidence. In the case of Hashimoto’s thyroiditis and Graves’ disease, the immune system can also attack the joints and muscles frequently in the feet and ankles. Like carpal tunnel syndrome, thyroid patients are also more vulnerable to develop tarsal tunnel syndrome. Add to this the increased risk of developing gout  and burning feet from painful neuropathy , and the incidence of foot pain in thyroid disease becomes very clear. Paresthesia can present in hypothyroidism. Researchers explain that the axonal myelin sheath, the insulating layer around nerves, begins to degenerate without sufficient thyroid hormone, and regeneration of damaged nerves also slows. Autoimmune diseases like rheumatoid arthritis, lupus, Sjögren’s syndrome, pernicious anemia, arthritis, and Type 1 diabetes can all present with paresthesia. I would guess that the majority of Hashimoto’s thyroiditis and Graves’ disease patients that follow Hypothyroid Mom have multiple autoimmune diseases. Susceptibility to infections of the feet, hands, fingernails, and toenails occurs in both hypothyroidism and hyperthyroidism, including Hashimoto’s thyroiditis and Graves’ disease and this includes Onychomycosis and Athlete’s foot. One of the classic symptoms of hyperthyroidism is excessive sweating, and that includes the feet. Sweat on your skin is a breeding ground for bacteria, and that can make things smelly. While hypothyroidism tends to result in markedly reduced sweating, the opposite is true as well, in particular in the case of Hashimoto’s thyroiditis. Hyperthyroid symptoms including increased sweating may occur simultaneously with symptoms of hypothyroidism in the case of Hashimoto’s. As antibodies attack and destroy thyroid cells, their stored supplies of thyroid hormone are released into the blood stream. These bursts or “leakages” of thyroid hormones in Hashimoto’s are responsible for the symptoms of hyperthyroidism. Thyroid hormone is required for the conversion of beta-carotene (that’s what gives carrots their orange color) to vitamin A. Buildup of beta-carotene in the case of hypothyroidism will be stored in the outer layer of the skin including the palms of the hands and the soles of the feet. Our feet can tell us a great deal about our thyroid health. They often show obvious signs of disease years and even decades before a thyroid diagnosis. Keen, M.A., et al. A Clinical Study of the Cutaneous Manifestations of Hypothyroidism in Kashmir Valley. Indian J Dermatol. 2013 Jul-Aug;58(4):326. Puri, N. A Study on Cutaneous Manifestations of Thyroid Disease. Indian J Dermatol. 2012 May-Jun;57(3):247-248. Safer, J.D. Thyroid hormone action on skin. Dermatoendocrinol. 2011 Jul-Sep;3(3):211-215. Yonova. D. Pruritus in certain internal diseases. Hippokratia. 2007 Apr-Jun;11(2):67-71. Taylor, J.S., et al. Pruritus. Cleveland Clinic. Center for Continuing Education. April 2010. Landis, E.M. The Capillaries of the Skin: A Review. Journal of Investigative Dermatology. 1938 Aug;1(4):295-311. Neki, N.S. Pitting Edema in Hypothyroidism. JIMSA. 2013 Apr-Jun;26(2):133. Dyrmishi, B., et al. Secondary hypothyroidism and the tarsal tunnel syndrome. Endocrine Abstracts. 2016;41:EP 1076. Giordano, N., et al. Hyperuricemia and gout in thyroid endocrine disorders. Clin Exp Rheumatol. 2001 Nov-Dec;19(6):661-5. Penza, P., et al. Painful neuropathy in subclinical hypothyroidism: clinical and neuropathological recovery after hormone replacement therapy. Neurol Sci. 2009 Apr;30(2):149-51. Macura. A.B., et al. [Nail susceptibility to fungal infections in patients with hypothyroidism and hyperthyroidism]. Przegl Lek. 2005;62(4):218021. Aktuna, D., et al. [Beta-carotene, vitamin A and carrier proteins in thyroid diseases]. Acta Med Austriaca. 1993;20(1-2):17-20. Keen, M.A., et al. A clinical study of the cutaneous manifestations of hyperthyroidism in Kashmir valley – India. Our Dermatol Online. 2016;7(1):5-9. Rich, P. Nail changes due to diabetes and other endocrinopathies. Dermatologic Therapy. 2002;15:107-110. I had the same problem with 2 doctors in separate states. Finally moved to NJ where doctor gave me the old fashioned basal metabolism test that showed all my symptoms to be from extreme thyroid deficiency. Started Thyroxin & became a new person in a few weeks. Doctor MacNeal said the new blood tests weren’t as accurate as the BMT. Wish today’s doctors cared enough to re-establish this method. Also, the synthetics don’t work as well. 46 years of experience with this disease, now called Hashimoto’s disease…I could write a book! Just found out I had thyroid issues, TSH 7.350, T3 uptake 25, Free Thyroxine Index 1.5. Doctor told me not bad enough to take meds. I feel tired, bloated, swollen feet, moody, irritable and can’t seem to lose weight. I started reading more about hypothyroidism and began taking natural supplements, hopefully, will see improvement. Also, seeing an endocrinologist in May.. Feel so discouraged. My daughter has excessive sweat glands, I took her in to see the doctor about hacking her thyroid because I have it, it came back normal. What can I do or see someone that’s going to listen. I have multiple symptoms of hypothyroidism, ive tried for years to get my doctor to listen. My thyroid test always come back low normal…. Who do i need to see to get help? Hey go on to the Health Unlocked website its absolutely Amazing, so many people support you and can advice what to do and take regarding this Awful illness. I have many issues with pain in my joints. I had my thyroid removed in 2016. It seems like I am a walking problem waiting to erupt at any moment. But, the CBS oil really does help with my pain issues. I do have issues with my feet since the removal of my thyroid. Matter of fact I have a Podiatrist appointment next week for toenail removal due to fungus. Which has resulted in ingrown toenails.